WASHINGTON (Reuters) - Fiat Chrysler Automobiles NV <FCHA.MI> <FCAU.N> has agreed to a settlement worth about $800 million to resolve claims from the U.S. Justice Department and state of California that it used illegal software that produced false results on diesel-emissions tests, but still faces an ongoing criminal probe. The hefty penalty is the latest fallout from the U.S. government's stepped-up enforcement of vehicle emissions rules after Volkswagen AG <VOWG_p.DE> admitted in September 2015 to intentionally evading emissions rules. Regulators said Fiat Chrysler used "defeat devices" to cheat emissions tests in real-world driving. 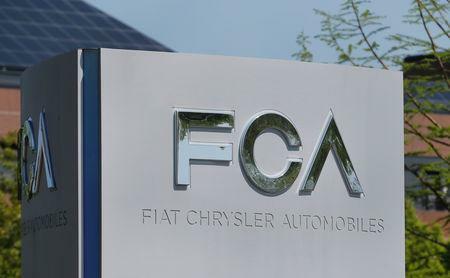 Fiat Chrysler said in a statement that "the settlements do not change the Company’s position that it did not engage in any deliberate scheme to install defeat devices to cheat emissions tests." The company did not admit liability. "You wouldn't pay $311 million total dollars to the federal government in civil penalties if there were not a serious problem," U.S. assistant attorney general Jeff Clark told a news conference. Elizabeth Cabraser, a lawyer for the owners, said the "substantial cash compensation" will ensure that consumers get the recall fix. Bosch, which also provided diesel emissions software to Volkswagen, also agreed to pay $103.5 million to settle claims with 47 U.S. states that said the supplier "enabled" the cheating and should have known its customers would use the software improperly, the New York Attorney General's Office said. Bosch said in a statement it did not accept liability or admit to the factual allegations, but that the settlement reflects "Bosch’s desire to move forward and to spare the company the very substantial costs and the burden on the company’s resources that would be required to litigate these issues." The Justice Department said the settlement does not resolve an ongoing criminal investigation into Fiat Chrysler's conduct, but officials declined to discuss the status. The U.S. Securities and Exchange Commission is also investigating. U.S. regulators are also investigating Daimler AG <DAIGn.DE> for alleged excess emissions in Mercedes-Benz diesel vehicles, but the Justice Department and Environmental Protection Agency declined to comment on the status of the probe - and would not say if any other automakers are under scrutiny. Daimler declined to comment Thursday but has acknowledged it faces investigations in Germany and the United States. In October, Daimler said operating profit would fall by more than 10 percent, blaming "government proceedings and measures in various regions" in referencing diesel emissions issues. "Fiat Chrysler deceived consumers and the federal government by installing defeat devices on these vehicles that undermined important clean air protections," said Andrew Wheeler, acting administrator of the U.S. Environmental Protection Agency. "Today’s settlement sends a clear and strong signal to manufacturers and consumers alike - the Trump administration will vigorously enforce the nation’s laws designed to protect the environment and public health." Wheeler said the settlement message is simple to automakers: "Don't cheat." California Attorney General Xavier Becerra said in a statement, "Fiat Chrysler tried to evade these standards by installing software to cheat emissions testing. The company not only violated the law and our trust, but did so at the expense of our environment." U.S. Principal Deputy Associate Attorney General Jesse Panuccio said at a news conference that automakers were on notice: "If you cheat our emissions tests you are going to get caught." With the Fiat Chrysler settlement, the U.S. Justice Department's total civil fines for both Fiat Chrysler and Volkswagen are now valued at around $2,500 per vehicle.